Anyone with an ounce of engineering sympathy will feel a natural suspicion of petrol-electric hybrids like the Toyota Prius and Honda Civic IMA. Transforming energy from one form to another is generally a wasteful process, shuffling backward and forward from one to another doubly so. In the Prius, regenerative braking followed by assisted acceleration is a case in point. Kinetic energy of motion is first transformed into electrical energy by the generator, and this is then converted to potential energy in the battery chemistry. On acceleration, reversible chemical reactions in the battery release electricity, powering the motor to build up kinetic energy once again. It’s a complicated and loss-prone round-trip. Bad, therefore, from an engineering standpoint. This messy business is one reason why Formula 1 cars, required to run regenerative systems next year, will be using Flybrid flywheels rather than batteries to temporarily bottle up energy during the slow bits of a lap. A wholly mechanical system with no major energy conversions is just so much more efficient in a world where every erg counts. An interesting alternative has recently emerged from a Scottish company called Artemis Intelligent Power, exploiting fluid power research done at the University of Edinburgh. Artemis offers a novel type of hydraulic actuator, which can act as either a motor or pump. It relies on a radial arrangement of pistons with ultra-rapid, digitally switched valves and has a very high claimed efficiency. In other words it wastes very little in turning the potential energy of pressurised hydraulic fluid into rotational mechanical energy, and vice versa. The system is called Digital Displacement. Interesting for diggers and tractors, of course, but also – surprisingly – interesting for hybrid road cars. To show off the potential of its new components, the company has butchered a BMW 5-Series and given it a transmission transplant. In place of a mechanical gearbox, driveshafts and differential, the Bimmer now boasts a hydraulic-pneumatic set-up. 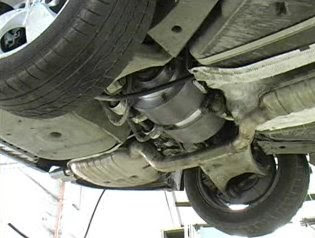 Under the car, the engine drives a Digital Displacement pump, pipes carry pressurised hydraulic fluid rearward to the back axle, and there a pair of Digital Displacement drives get the rear wheels moving independently. The pump and drives don’t have to spin at the same rate, allowing the overall computerised system to provide infinitely variable transmission ratios. The engine can spin at its most efficient rate, irrespective of the speed of the car, depending only on the power demands made by the driver’s right foot. We’ve not tried it, but Artemis says the car remains highly drivable and retains its original performance envelope. Hybrid energy storage is done pneumatically. During braking, the rear actuators switch from drive mode to pump mode, putting energy back into the hydraulic system and using it to pressurise a gas cylinder. When acceleration is demanded later, the energy stored in the cylinder is released back into the hydraulics, driving the wheels. It’s a neat, purely mechanical system that cuts out the wasteful electrical and chemical steps demanded by a petrol-electric setup. And the results speak for themselves: on the tough urban cycle the BMW 530i normally scores 20.4mpg; with Artemis’s digital hydraulic system, it scored an independently verified 40.1mpg. Beyond the urban crawl, the standard car gives 29.7mpg on the combined cycle – the hydraulic car achieved 39.6mpg. And finally, Artemis says its hydraulic transmission is “potentially much more durable, lighter and cheaper than electric hybrids”, with their engine-plus-motor-plus-batteries bloat. To put it cornily, the land of the rising sun may currently have the lead in hybrid technology, but the canny Scots could soon put them in the shade.